Belated birthday celebrations for Mr O saw an invitation sent around to the usual crew. The invitation was an email that simply contained a link to a YouTube video of Coldplay’s hit song… yep, you guessed it… Yellow. Yellow is the latest offering from dynamic duo Brent Savage and Nick Hildebrandt. Sliding somewhere in between their original restaurant, Bentley Restaurant & Bar, and their wine bar, Monopole. 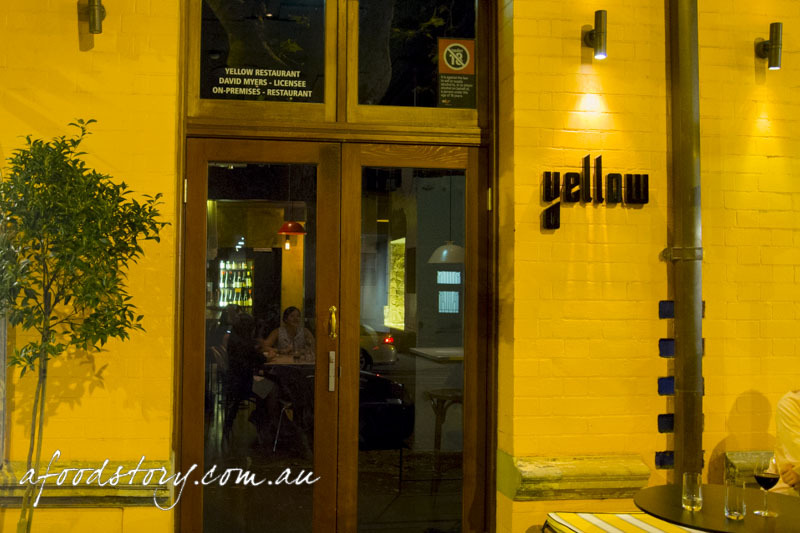 Yellow is all about good food at affordable prices. While having a look at the succinct food menu and rather comprehensive wine list a generous portion of house baked sourdough was delivered in a cloth covered basket. 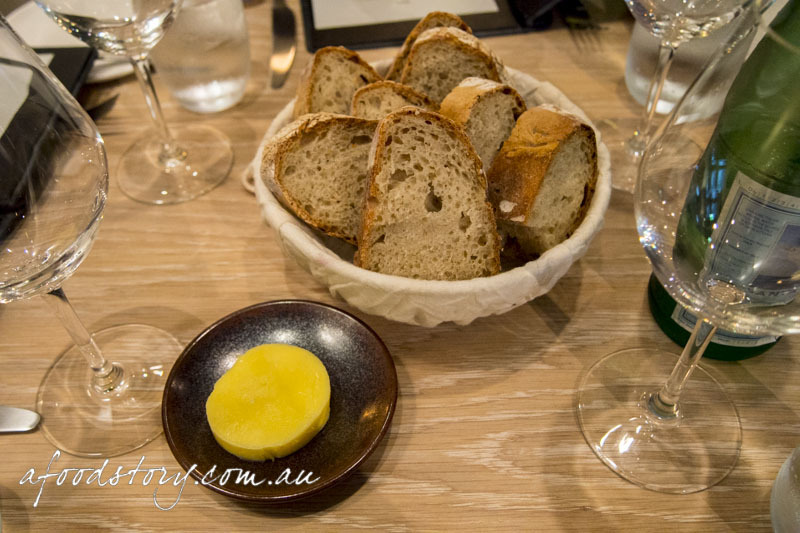 I can rarely (if ever) hold back from freshly baked bread but when it arrived accompanied by whipped house cultured butter then I knew I was really in trouble. Must not fill up on bread! 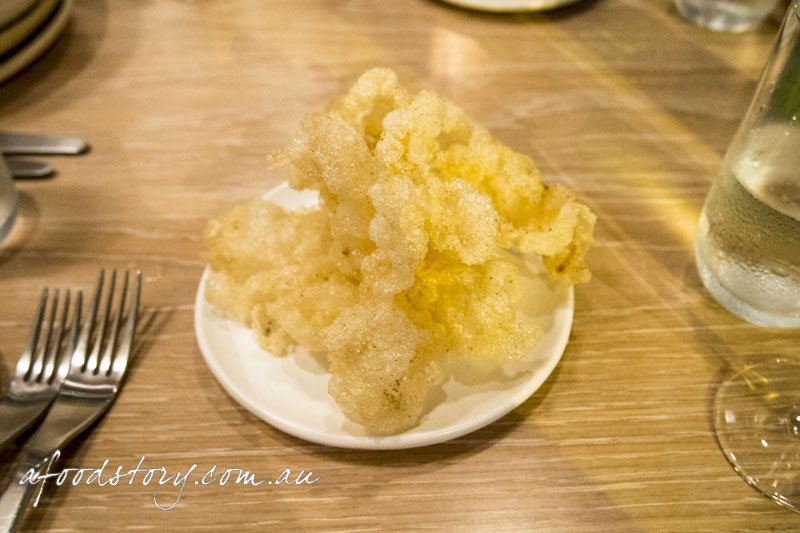 Our first insight to Yellow’s kitchen was a share plate of beef tendon crisps. Prawn cracker in appearance we all assumed they’d be nice to nibble on but what we didn’t expect was just how good they would be. With the texture of a prawn cracker (an extremely fresh prawn cracker at that) and an overarching beef flavour we all stopped and started to pay closer attention to what was in front of us. Stopping short of dissolving on the tongue the crisps had a nice chew to them and were seasoned well making them both delicious and extremely moreish. When dining with Mr O we’ll often order oysters. Sometimes I’m just not that fussed with oysters and could take them or leave them. Em categorically hates oysters. And so it was Mr O and Dylan up for the oysters and therefore they only ordered half a dozen. I was gifted an oyster and realised we should have ordered more. 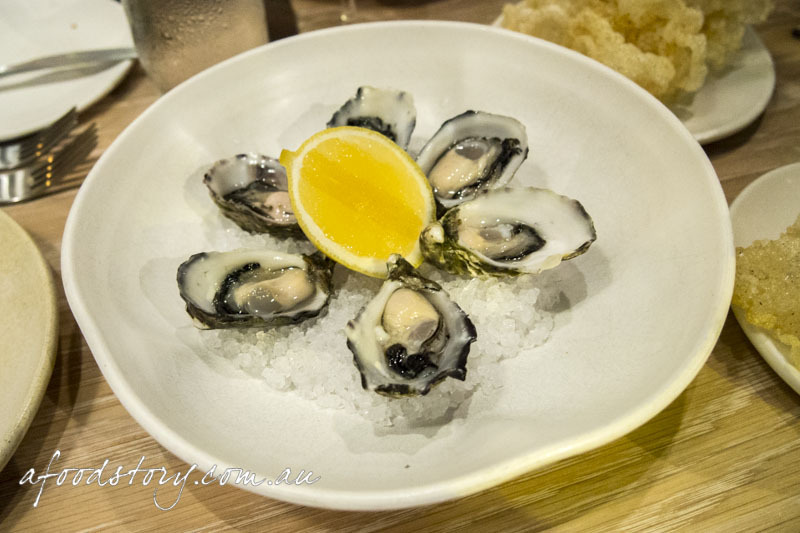 Freshly shucked Sydney Rock oysters that tasted like the sea, they were beautiful. 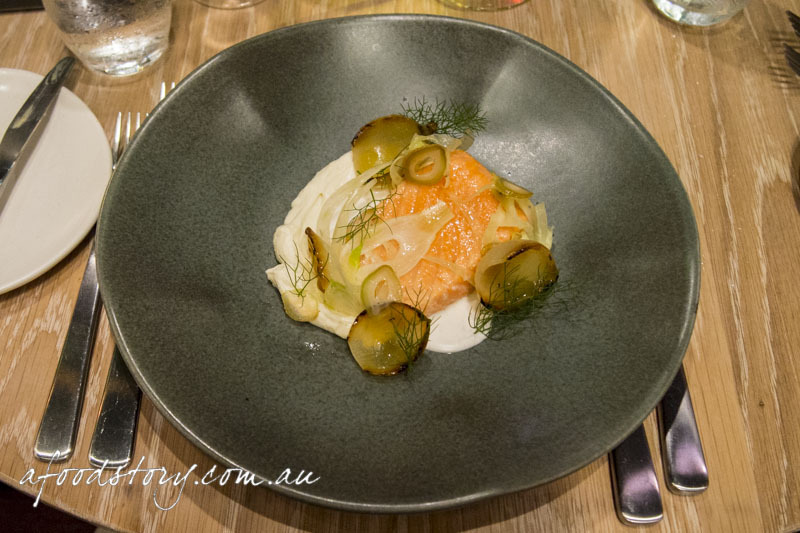 Slow Cooked Ocean Trout with Young Onions, Fennel & Almond ($18.00). Indecisive as always I was tossing up between a number of entrées (and mains!) but it was the slow cooked ocean trout that I kept going back to and decided I had to go with my first instinct. I was certainly glad that I did. Slow cooking rendered the ocean trout lovely and moist. I adored the bed of almond puree and the anise flavours of the fennel which were strong enough companions to the flavoursome fish. Young onions were char grilled and sweet, offering both a great flavour profile and a textural change, complementing the nutty puree and stark anise. The combination of flavours in this dish were unusual but delectable. Pulled Pork with Kohlrabi and Dandelion ($19.00). Dylan was also torn with the menu. He was keen to get the lamb tongue for entrée and the lamb belly for main but thought better of it. Instead he chose the pulled pork to begin. The pork was soft in texture and quite delicate in flavour, quite different to a Mexican pulled pork that is all about the spices, this was the opposite as it was all about the pork. Ribbons of kohlrabi were the textural opposition to the pork and gave the dish a little peppery hit akin to that of cabbage heart. 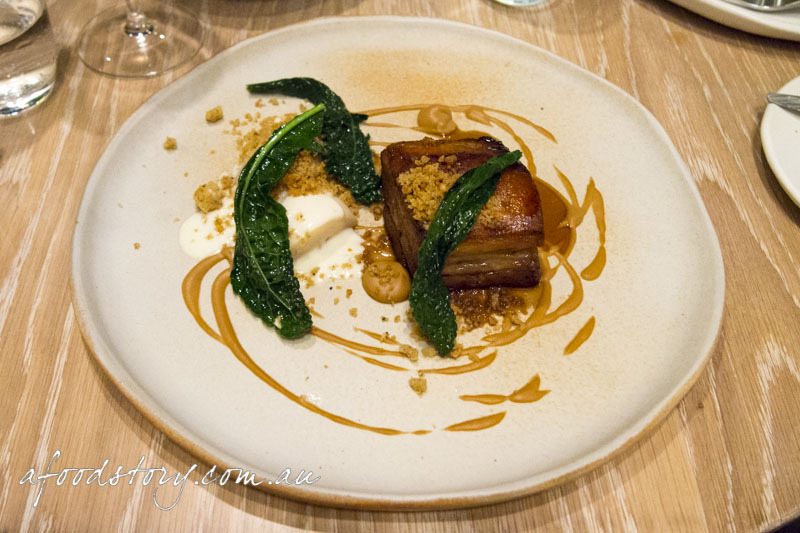 Crisp Berkshire Pork, Cavolo Nero, Buttermilk & Pepper Crumbs ($28.00). It was the promise of crisp Berkshire pork that made my decision for mains. Cooked superbly this was a well-executed dish. Polar opposite to Dylan’s pulled pork entrée this pork lived up to the dish’s namesake and was lovely and crisp. Also being higher in fat and with a more intense cooking technique the Berkshire pork belly was bursting with flavour and juicy from the extra layers of fat in the belly. It was a solid main course but I have to admit I had food envy and had eyes for Dylan’s lamb belly. 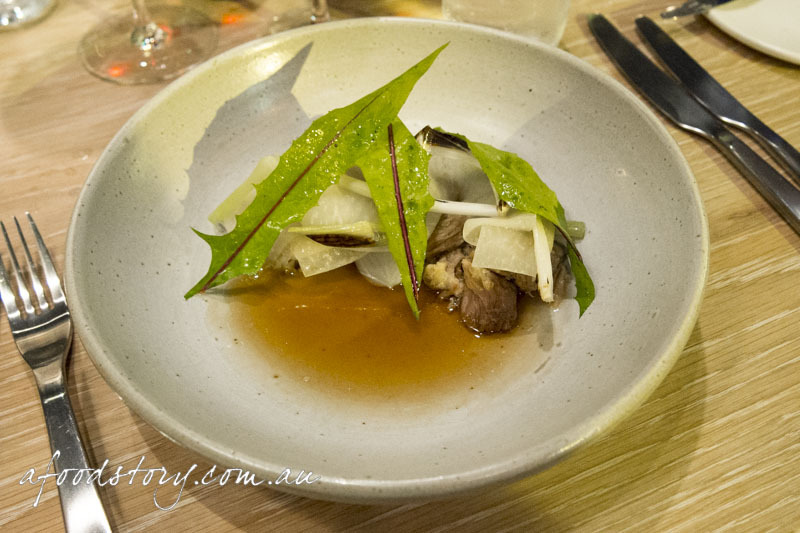 Lamb Belly with Broad Bean, Celery & Purslane ($27.00). While Dylan decided he shouldn’t have lamb followed by lamb it was the lamb belly that won out and the dish that I had eyes for. A rather impressive serving of two large chunks of lamb belly and a medley of broad beans, celery and purslane. The quality of the lamb was outstanding, its skin crisp and meat soft. 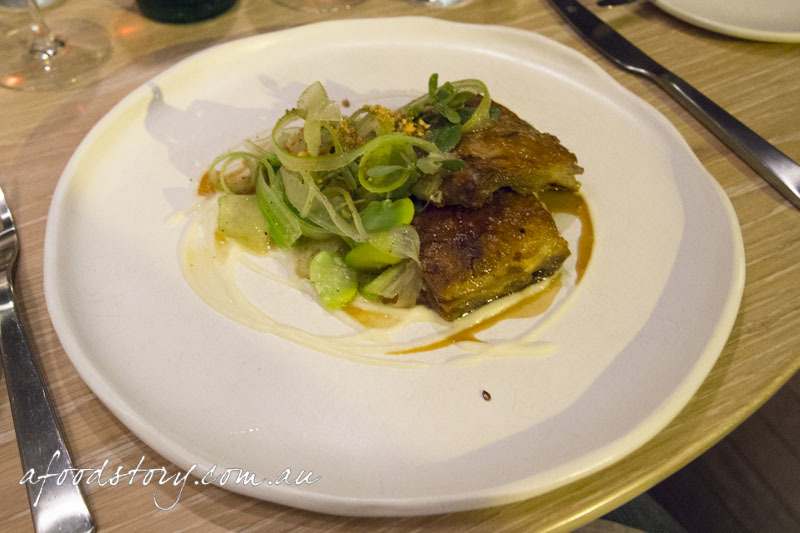 Lamb can be quite heavy but the team at Yellow wisely paired the unctuous lamb belly with a light, fresh salad. 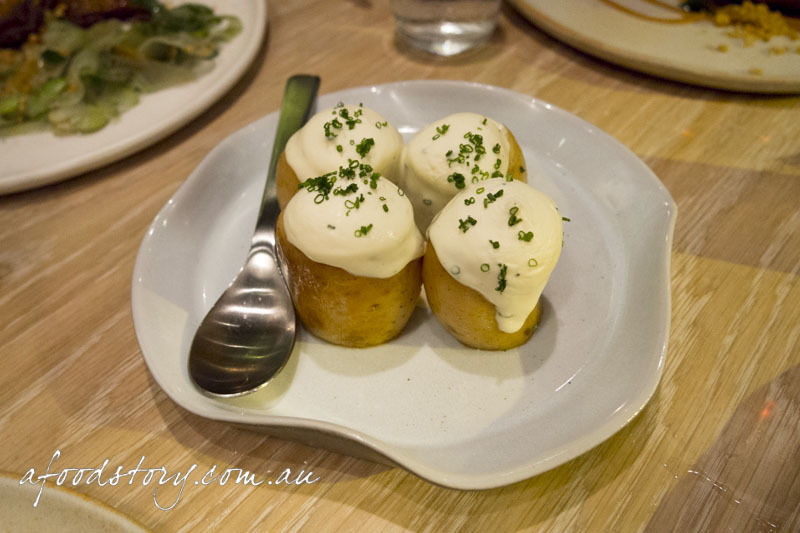 Jacket Potato with Sour Cream & Chives ($10.00). Don’t forget the potatoes! Dining with Miss Em means potatoes are a must. Add sour cream and chives and there was no way these weren’t being ordered. Oh my goodness. Potatoes cooked in their jackets don’t get a big enough rap. Soft and giving, the sour cream oozing and melting into the potato, fresh chives sprinkled on top and voila. Delicious. Sugar Snaps with Garlic ($10.00). And of course sugar snaps had to be ordered over the cos salad with lemon and mustard dressing because I love sugar snaps and do not love mustard. There’s something absolutely stunning about nicely cooked green veggies like sugar snaps and broccoli. I just love them. 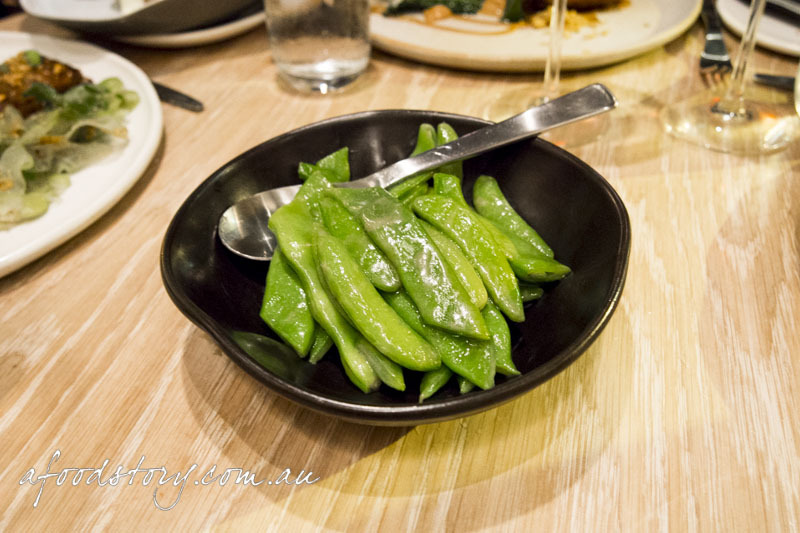 These sugar snaps were vibrant with a nice crunch and just the right amount of garlic. Chocolate Parfait with Rhubarb & Oat Milk ($15.00). 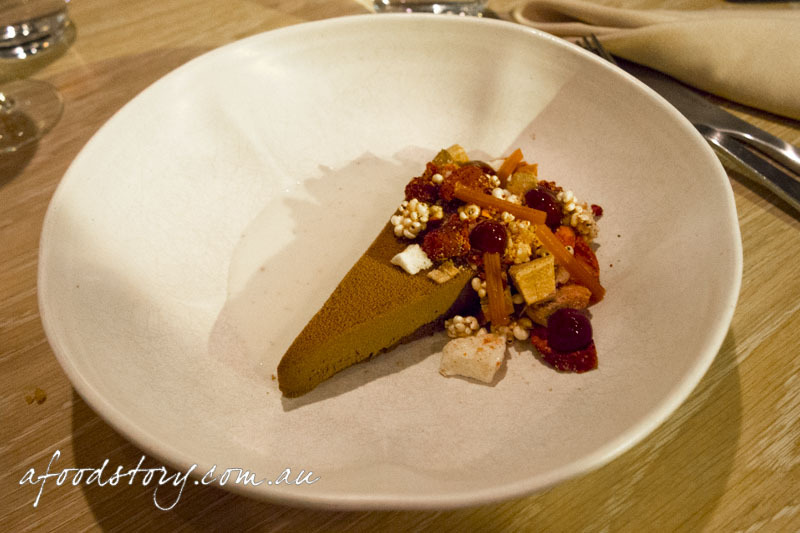 Brent’s desserts at Bentley are some of the best I’ve had in Sydney, he’s got a keen eye for balance of flavours, temperature and texture, so I was keen to see the offering at Yellow. Naturally I couldn’t go past the chocolate. A mighty fine slice of chocolate parfait with a crumbly dark chocolate base, flocked with milk chocolate, adorned with fruit and a pool of oat milk. Beautifully smooth and creamy, the parfait was stunning on its own. Freeze dried berries including white mulberries, strawberries and raspberries, as well as raspberry gel and poached rhubarb offset the luscious chocolate. Dylan did something a little different and ordered the selection of cheese. We all love cheese but rarely order it as we struggle to pass up dessert. Dylan on the other hand isn’t a huge sweet fan and when nothing really grabbed him on the sweet side of things he decided to order cheese for once. Yellow dish up a variety of cheeses depending on what’s mature at the time. 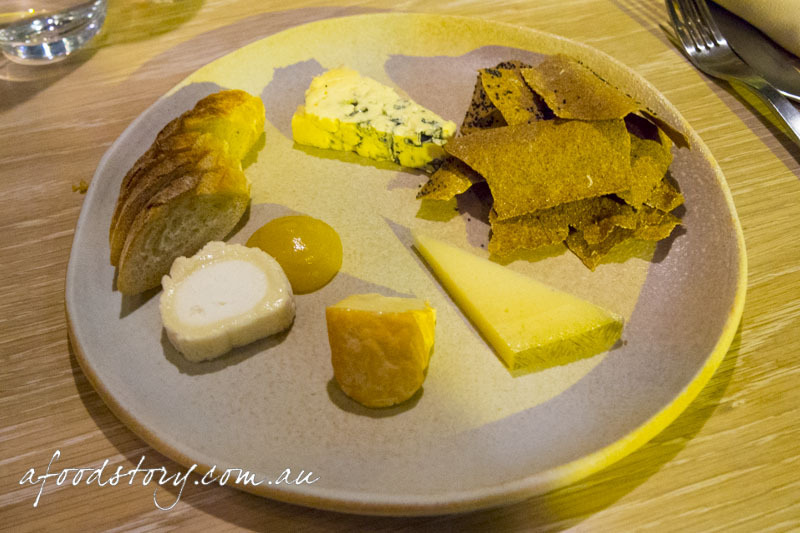 This time around the selection included four cheeses – a delightfully rich blue, piquant manchego, soft goat’s milk and red rind cow’s milk. 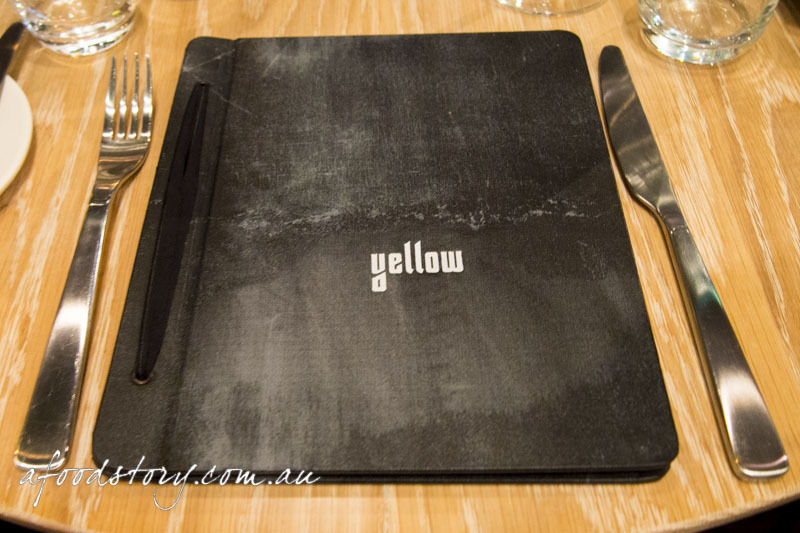 We all thoroughly enjoyed our first meal at Yellow and surprisingly did not overeat (for once!) The ocean trout and chocolate parfait were exquisite and by all accounts the lamb (both the tongue entrée Mr O smashed and the belly Dylan devoured) hit all the right notes. 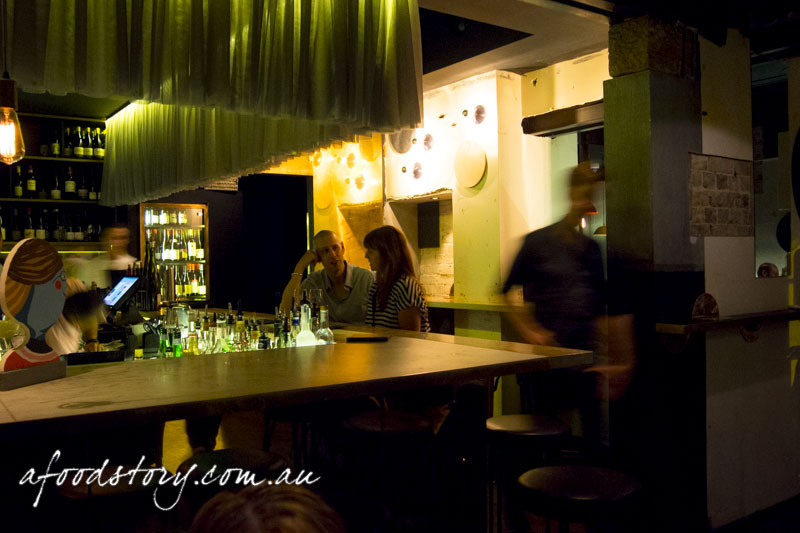 Another great addition to the Potts Point dining scene. We love the casual offering Brent & Nick have added to their portfolio and it’s nice to see their team growing. Head chef Adam Wolfers was at Bentley before he took the reins at Monopole and is now the main man at Yellow. We can’t wait to get back to try more of the menu. P.S. Happy Belated Birthday Mr O ! ! ! the beef tendon crisps look awesome but im dying to try the lamb! Definitely need to try the lamb Suze! I want to head back and get the lambs tongue AND the lamb belly! Great review. I feel like I need to go back and try again, maybe order the lamb belly or Berkshire pork this time! Thanks Shahrzad! I’m also keen to go back and try more dishes, so many things to try!